As mentioned in my previous post about the John Brown Farm/Homestead in North Elba, NY, I spent this past weekend vacationing in the Lake Placid area! Yet another one of the favorite historical sites (and generally beautiful spots) that we always love to visit is the Jay covered bridge, in the town of Jay, NY near Keene. Quite a while ago I blogged about this site on my old history blog, so I figured that with my most recent visit (full of beautiful fall-time photographs), I should write about it again with a little more insight, having visited it several times now. The Jay covered bridge sits over the beautiful Ausable River that runs through Essex County and Jay, NY. The town of Jay, New York (originally known as ‘Mallory’s Bush) was founded in 1797 by an early Adirondack settler, Nathaniel Mallory. Erected in 1857, this ‘wooden howe truss’-style bridge was one of many of its kind. 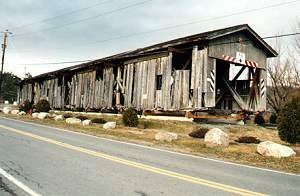 But due to weather, time, and the occasional storm hitting the ADK’s, the covered bridge in Jay is the only remaining original covered bridge in the Adirondack park. It was restored in 2006, and is perfectly safe for crossing by foot. The architectural form of a howe truss bridge is an overly simple weight-bearing device. The bridge has a very antiquated look – contemporary covered bridges mimic the original architectural design, but this bridge hearkens to an earlier era of portage. 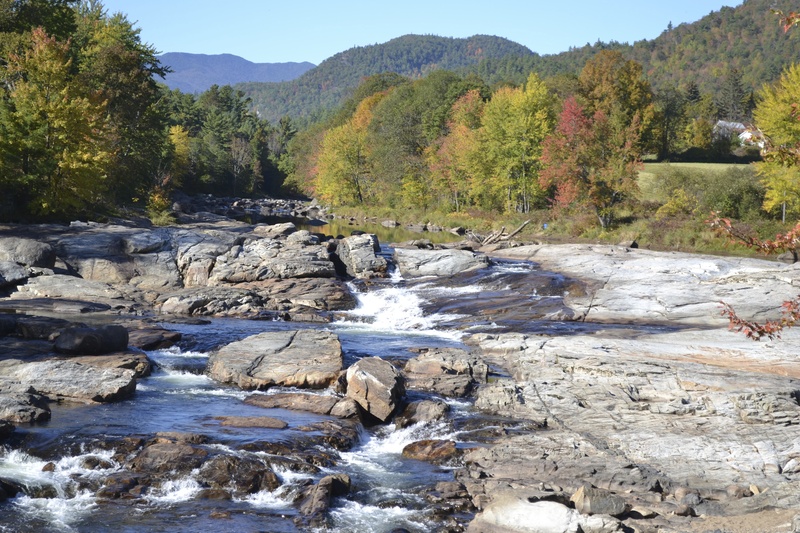 The original bridge that sat on this location prior to the Jay Covered Bridge was destroyed by flooding in 1856, leading to the construction of the current bridge. The views of the Ausable River through the windows of the bridge are stunning. I have only ever seen it in the winter, when the river is covered in ice, but in the summer it is certainly just as beautiful. This plaque just outside of the bridge marks it as a historical site. If you are ever traveling through the ADK’s and find yourself in Jay, New York, stop by the Covered Bridge that sits over the Ausable River. It makes for a great photo opportunity, and will be your only chance to see a historical Adirondack covered bridge! Below is a Vine video that I made while visiting the covered bridge. Click the un-mute button in the upper left-hand corner to hear the sounds of the Ausable River beneath the bridge! 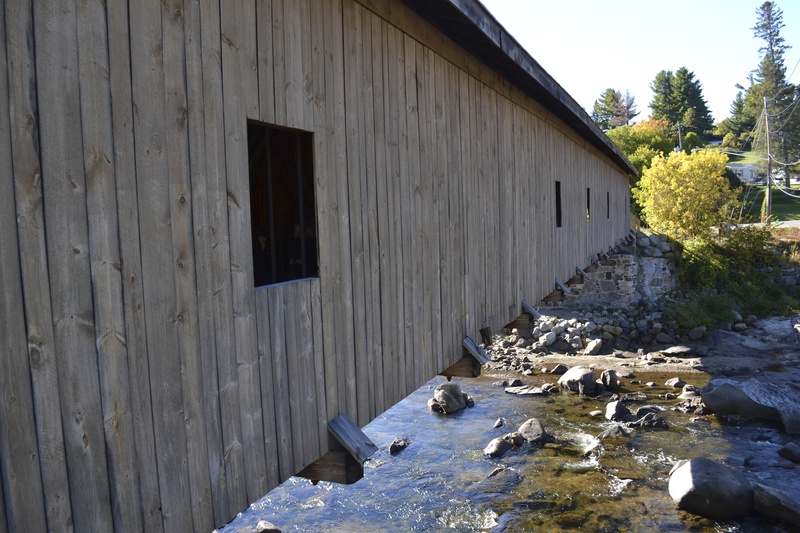 In any case, the Jay Covered Bridge is a gorgeous location to stop and snap a few pictures of the Ausable River, or read the history of the site on several large boards posted in front of the bridge. If you ever find yourself driving through the town of Jay, a quick trip to the covered bridge is a must!